The first semester is over and Timber Creek students return to school on Jan. 4, 2018 for their first day of the Spring semester. But that’s not all they need to know about the second half of the 2017-2018 school year. Unlike the Fall, students will not receive a printed schedule for the Spring semester when they return on Thursday, Jan. 4. Students will need to check their HAC Thursday morning and follow that schedule. If a schedule change is made after 8 a.m. Thursday morning the student will be sent an updated printed copy. All students will have a short, two-day school week with an A Day on Jan. 4 and a B Day on Jan. 5, 2018. When students come back Jan. 8, it’ll be an A day again. Then we’ve got the first three day weekend of the year with students and teachers off on Jan. 13-15, and returning to a B Day class schedule on Jan. 16. Take a look at the January to March calendar below. Early Bird registration deadline Feb. 2 at 4 p.m. 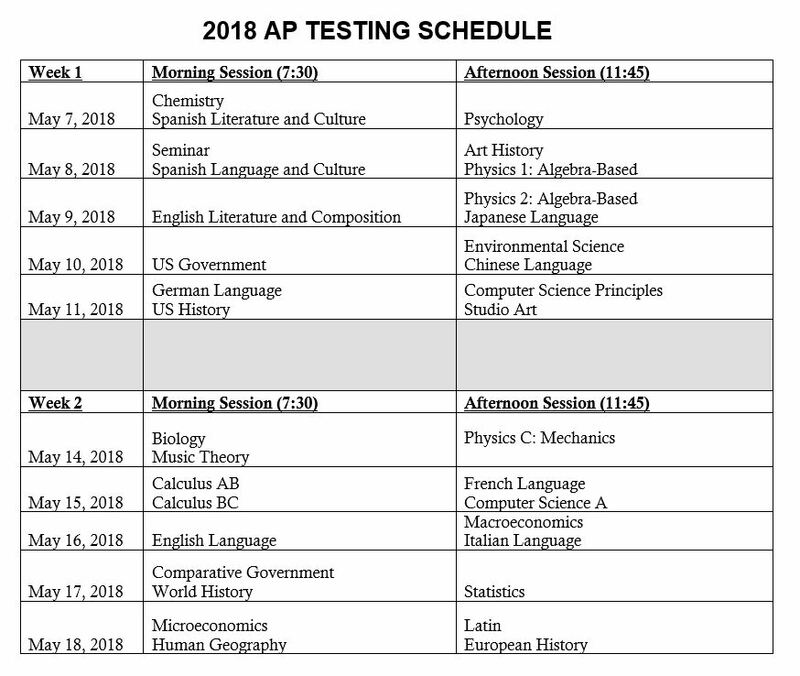 FINAL AP Registration deadline March 23 at 4 p.m. The Class of 2018 has only a few months of high school left…but there will be plenty for them to do. The second Mr. Falcon Pageant will be held Friday, Feb. 2. Mr. Falcon ticket sales start on Jan. 10 for $5 each ticket. Students can purchase these during lunches in M106, or before/after school, or from contestants. P.S. Seniors – have you submitted college applications? Have you asked for letters of recommendation? A helpful tip: Pick up a packet in the counseling office to complete and return to those teachers or counselors that are willing to write those letters on your behalf. Remember to give plenty of notice, like a couple weeks, so that you get them back in time for deadlines! And a reminder to them is always appreciated! We’ll have a lot more Senior info coming up. Hang tight. But that’s not all — we’ll have schedules for Baseball and Softball live streams in the near future and some additional sports programming details. Now let’s get to the News, literally. TCTV is launching a live news production with a brand-new set, new graphics and professional-level reporting each Friday starting February 2. These 10 minute weekly productions will look just like a shortened version of network newscasts and will be available to stream live for free or view a replay on the same day. Broadcasts will be at 10:30 a.m. each Friday unless otherwise announced. Look for more details in the next two weeks. Plus, there’s some other TCTV announcements we can’t tell you about just yet. TCFM is going big for 2018, introducing hours of new music, incorporating your requested songs, and producing more original programming. Expect to hear a professional-quality radio station with more personality, impact and great sounds as the station gets to a big February to March push for listeners. Very good information to share, thank you!